About Us Thuro Clean Carpet & Upholstery Cleaning of Myrtle Beach, SC! 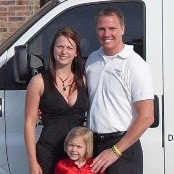 Meet Your Myrtle Beach Carpet Cleaning Team! Located in Myrtle Beach, SC, Thuro Clean Carpet and Upholstery, LLC. has been serving our neighbors all over the Grand Strand since 2005. For the past 10 years the Inman family has strived to exceed the expectations of our clients by providing well trained, hard working professionals. Thuro Clean does the best job possible at low prices for all its customers. Thuro Clean strives to service the community one day at a time. This is what sets them apart and makes them stand out in the community. Our Myrtle Beach area residential division has served thousands throughout Horry and Georgetown counties, and they have the knowledge and know how to get your floors looking great once again. Our commercial division is large enough to tackle even the largest buildings resorts, stores, restaurants etc. Thuro Clean Carpet and Upholstery, LLC. not only has truck mounted units but we also have portable units so we do not have to drag hoses throughout your facility or hang them from balcony railings inconveniencing your customers or guests. We also offer after hours cleaning so there is no loss in productivity or inconvenience to you, your staff, or your business! As a competitive company Thuro Clean is looking to build a lasting relationships with all their customers, so with that said we are willing to compare prices for all residential & commercial services we provide. So if you are currently using our services and find our prices to be higher than our competitors Please feel free to call and compare the competitors prices before changing to another service provider. Thuro Clean also makes it a point to rectify any problems that occur during a job that they may be responsible for. This is how they continue to build relationships with their customers, which is the most important part of their business. Thuro Clean Carpet and Upholstery, LLC. also offers a long line of other services including dryer vent and air duct cleaning, upholstery cleaning, and draperies to name a few. Contact us today to meet with one of our professionals for a free consultation to see how we can best serve you!